Great! But, how do I get started? What does my child need in order to notebook? and where do I get it? The truth is, notebooking really IS just as simple as writing in a notebook. While there are many flashy elements you can use to enhance a notebook, don't feel pressured into taking out a line of credit in order to pay for them all. A notebook and a pencil. That's all you REALLY need. If you are looking to add some "jazz hands" to your notebooking pages or just wanting the experience to be more user-friendly, there are many great resources and tools that I'd recommend. Here's a quick list of basic supplies that are great to have on hand for ANY kind of notebooking. We keep most of these in an antique milk crate turned art caddy that sits right next to our dining room table. I've found that if your supplies are not easily accessible, notebooking becomes a drudge. The hassle of dragging out all the supplies will deter you from scheduling it into your day. By having them all within arm's reach, you can quickly transition into notebook mode within seconds! I prefer the ones with the pockets so that any loose items that are being worked on can be stored in the pocket until they are permanently attached in the notebook. These are helpful for preventing weighty/heavily embellished pages from tearing away from a binder. I prefer the colored ones for creating lapbooks because they are just prettier to look at than the plain cream colored versions. These are an inexpensive way to create sections to a composition style notebook. Use these to protect art work or 3-dimensional pages. These are great for holding projects, mini books, brochures, etc. and can be inserted into just about any 3-ring binder. Cardstock is essential for creating mini-books or adding flaps, tabs, or envelopes to a traditional page. The heavy-weight paper is more durable than standard sheets. These are great for adhering memorabilia, nature elements, souvenirs, etc. to a page. My children have never wanted to add these to their notebooks, but many children do. It makes for a cleaner, more polished looking page. Use these to make moveable parts (circle charts, tabs, fact fans) on a traditional page. 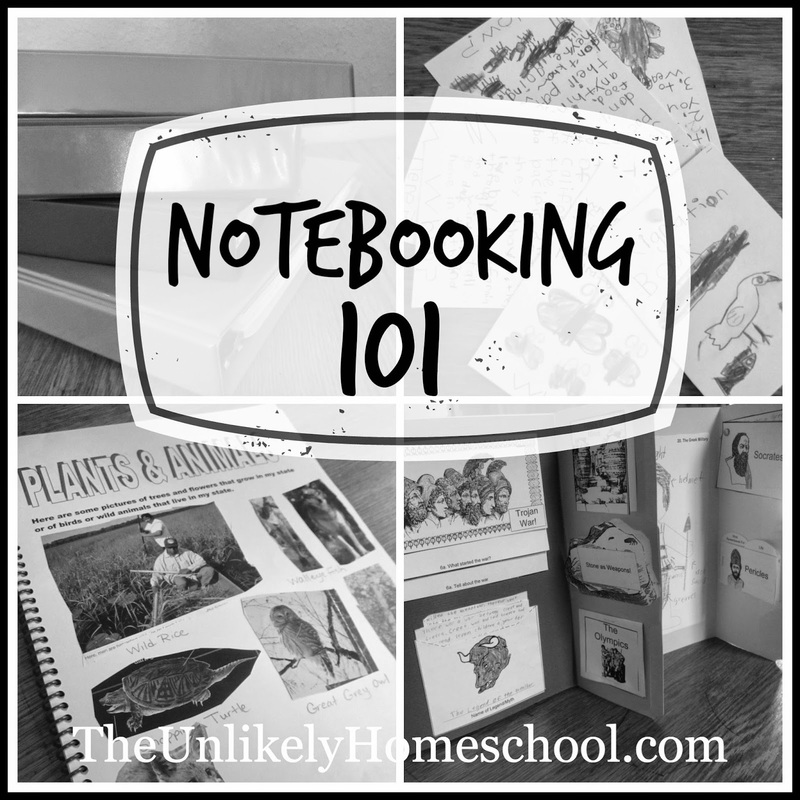 The following is a list of tools that make the process of notebooking a bit easier. Clipboards provide a sturdy writing surface for when you happen to be outside or on the go. I prefer the clipboard box over the a standard clipboard because you can store basic notebooking supplies inside of them creating a "desk on the go". Little ones tend to get frustrated if all of their supplies are inside a backpack and have to be dug out individually. Often times, I have my younger children dictate their narration for me to write down on a dry erase board. They can, then, copy it word-for-word into their notebook ensuring proper spelling and punctuation. I, almost always, find a picture of what my children are wanting to draw in their notbeooks by using a google image search. Children, especially those who do not like to draw, are bound to feel more confident and have more success in recreating a picture if they have a sample with which to copy. This is a MUST HAVE if you want your child to make a fact fan or mini book. Little hands rarely have the precision necessary to cut straight lines to exact measurements. Science, nature, and travel magazines can be torn apart and used to provide colorful photographs/illustrations to an otherwise black and white page. We often pick up free/discarded magazines in the FREE bins at our local library when we are working on a particular notebooking project. While traditional composition notebooks are great for older students, I prefer the primary versions for my younger kids. These modified comp books provide learning-to-write/primary lines for writing the narration as well as a large blank space on each page for creating an illustration. This is a wonderful site filled with free printable lapbook kits for hundreds of different topics and units. They are all categorized by age range but with a little tweaking, can all be used for multiple levels. Many of the units on this site can be ordered a la carte style, but I prefer the lifetime membership plan. A lifetime membership gives you access to hundreds of notebooking pages about particular topics as well as many generic pages to be adapted to any topic of your choosing. There is also a "create your own page" illustrator tool which allows you to create your own custom page. I love this site because it offers a wide range of pages about the same topic so that multi-age households can all be notebooking the same information at many different levels. Order complete ready-to-fill-in notebooking and lapbooking units for a variety of different themes and topics. Each unit is individually priced making it easy to order a last minute pack if needed. This a great HOW TO notebooking site to get you started. You can also find hundreds of FREE printable notebook pages as well as links to other free pages around the web. This site offers both FREE notebooking pages as well as units that can be purchased for a small fee. This site offers a limited amount of downloadable pages. Most are geared more towards lower elementary kids but ALL are free. Print out generic/all-purpose notebooking pages for FREE. Jamie, these tips are super helpful for the beginner! Thank you! Yeah! So glad to know. I was hoping they would be. Thanks for saying so. Hi Jamie, I just have to say thank you so so much for taking time out of your life to share all the research and ideas you have come up with. It is truly inspiring to me. I'm still working on the execution of it all. You really are a blessing from God to me and our homeschool. Thanks and God bless you. Hi, Jamie - I am commenting here way after your post, so this is really just a test comment to see if you will be notified of it, and be able to answer. I have some questions about notebooking / starting with a second grader, and I am needing a little encouragement / advice on getting us going in the right direction. I'd love to help you if I can.